High-speed steel stretches aftermarket tube performance. Flambeau's Fowl Max waterfowl choke tube patterned well with Kent and Hevi-Metal loads. The modern waterfowl shotshell is changing fast. The current trend is the addition of more velocity, better base components, and both priming and propellant energy-generating systems. In effect, the modern shotshell is just that: quite a modern development when compared to loads of yesteryear. Right along with the new direction in shotshell load development has come better payload delivery systems, specifically the choke on the shotgun's muzzle. Longer-range loads have brought about choke tubes clearly able to take on the new faster shotshell ammunition and send it farther downrange as a solid working payload of pellets. I realize some waterfowlers are not interested in shooting to range limits that exceed a reasonable decoy gunning distance. However, pass shooting and applied specialty gunning scenarios often require better downrange ballistics. I remember a time when most waterfowl hunters said non-toxic shot was pure junk and had no chance of saving waterfowl hunting as we knew it in the good old days. Well, that thinking went the way of the buffalo, didn't it? Today, waterfowl hunters are saying non-toxic loads are too good and shoot too far. I guess some folks are just never happy. I selected several aftermarket choke tubes to test. I used the standard 30-inch circle downrange and distances to 40 yards to assess patterns for percentage inside the circle, core density and pellet spread uniformity. I selected Kent Cartridge 1â…›-ounce No. 1 steel shot at 1,560 feet per second and Hevi-Metal 1¼-ounce BB steel shot at 1,500 fps as my standard loads with each choke tube test fired. My test gun was a Winchester Super X3 with a 3-inch chamber. I selected these loads because the Hevi-Metal load is an example of a blend of steel and lower-grade tungsten in a budget-priced shotshell, and Kent 3-inch, 1â…›-ounce loads are a well-known cost-cutting alternative, but still retain fast pellet velocity downrange. I'm also basing the selection process on pre-testing with my Dead Ringer "ring" system, which proved these loads can shoot very well. Sure, I could have elected to test shoot Winchester Xtended or Remington HD tungsten-iron and have it shoot well in all chokes, but what's the gain there? Most waterfowl hunters shoot budget-minded loads with the ability to take game cleanly. Environ-Metal Inc., the makers of Hevi-Shot, have turned to designing and marketing their own brand of choke tubes. The Hevi-Shot tube makes use of a ring system (three rings much like the Dead Ringer) but also uses tube constriction (.671) and parallel slit porting vents as an added element to control payload downrange. I elected to put the turkey choke, built in both waterfowl and turkey variants, in their new high-performance model to the test. The tube is tungsten-safe and can take on any hard steel shot material, but in this model it's an advanced, ultra-tight-shooting, long-range choke constriction. To my way of thinking, if it's good on long-range turkeys, why not as a pass shooting or specialized field gunning tool for waterfowl? Different target, but the same goal. Built as a heavy choke with massive parallel section extension, this tube makes use of straight-line porting, as well as a different small, round-hole port system. With a tube constriction of .710, it makes for a good balance between a tight tube, gas relief and its ability to reduce payload stress and vibration prior to exiting the muzzle. Just about the time I was wrapping up this discussion regarding choke tubes, Carlson's Chokes sent a set of three choke tubes for my Winchester Super X3 that included an extra-full long range waterfowl special payload control system. I was about to head for Minnesota on an extended fishing and hunting trip, and crows over decoys were part of the deal. I asked Todd Gifford, my pal and partner, to push some decoys back a bit on our freshly cut hay field to get some 50-to-60-yard birds. I shot Winchester Xpert 1-ounce No. 6 steel shot general-purpose loads. The Carlson's choke sent payload after payload of the small pellets at long-range crows with devastating results. My partner shot a stiff 2¾-inch, 1¼-ounce No. 6 lead at the black bandits. After seeing the buzz-saw effect of the Xpert matched to my choke tube system, he switched to a tight full choke and No. 6 steel on the next incoming bunch of black-feathered devils. Selecting two chokes from my test and evaluation box that will be henceforth called X and Y, I found it possible to obtain some very different and less-effective results on the pattern board with long-range, high-performance choke tubes. Shooting the first sample choke with ultra-high velocity ammunition produced the following results. Sample Y was a choke designed with long range in mind. The tube used porting and internal geometry set up for ultra-tight, extended-range patterns, according to the manufacturer. However, like the previous choke, it didn't roll out the best performance, either. Nothing! However, several choke tubes didn't work well with my selection in waterfowl ammunition. I see this result often. The lesson: Don't assume anything about chokes. It was clearly indicated the selected test loads were ultra-high velocity types --something we are seeing more of within the waterfowl load marketplace. The X and Y tube designs just could not handle the payloads and keep pellets on target center. Fast pellet speeds can return blown patterns, and that's exactly what happened in this case. By my count, only three choke systems out of the field could be regarded as high-performing with these loads. Does that mean chokes X and Y are worthless? No, not at all. Rather, it suggests shooters should take a look at different shotshell load options such as slower velocity, different brands and shot sizes. While this review is not about stroking anyone in particular, Environ-Metal, Carlson Chokes and Flambeau seemed to have gotten it right, at least in terms of my gun and their chokes. Remember, the Browning barrel used on the Super X3 is overbored to .742, not the basic .724 industry standard. Can that make a difference? Yes, back boring or overboring a barrel can change the pattern. Fixing the problem means patterning your loads each and every time you change shotshell ammunition, guns or choke systems. I'm willing to bet at least two-thirds of shotgunners today don't pattern much of anything. Some hunters even buy very expensive chokes and just assume they are working just fine. But looks and cost don't necessarily equate to great-performing chokes on waterfowl guns. My advice is simple: Find a choke system that works well with a wide range of loads or even a few selected loads, and then use that choke and those specific loads all the time. I know professionals who follow this rule and shoot the same shotshell and choke all the time. If it isn't broke, don't fix it. 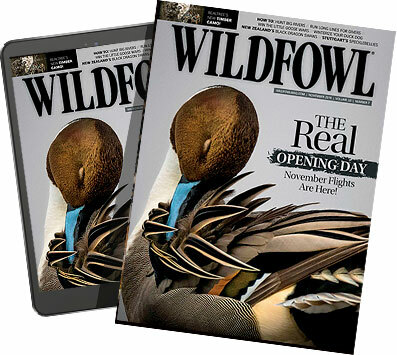 When wrapping up this review, I was contacted by a Wildfowl reader and informed that his Y-model choke reviewed here was shooting very well as applied to his gun and selected loads. I was not at all surprised by that observation. Your load and shotgun make a difference in the performance end of a waterfowl gun.